What to do with those veggies in the fridge? 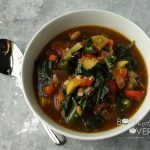 Vegetable Soup this is light, crunchy and very flavorful and delicious! Chop all of the vegetables. I chopped each veggie and just piled all of them in a large bowl with the exception of the spinach & garlic. Heat a large stock pot over medium high heat. Add the butter & olive oil. When hot & bubbly add all of the vegetable except the spinach & garlic - Add carrots, green beans, celery, zucchini, bell pepper, onion & minced chili. Reduce heat to medium and saute for 10 minutes. After 10 minutes add the white beans, spinach, garlic & pesto. Mix well to combine. Then add the vegetable stock - heat thru & the soup is ready to serve.